Marivelisse Acosta is from San Juan, Puerto Rico. She's now studying communications at CCSU in New Britain, Connecticut. 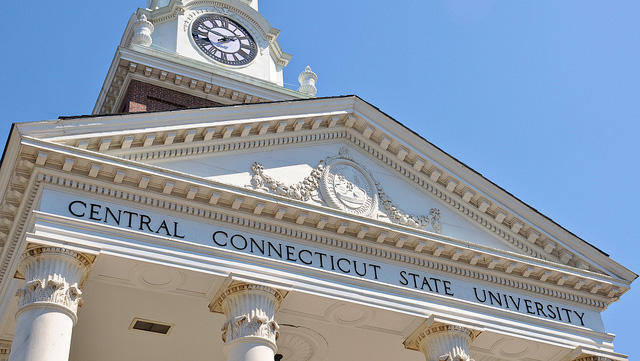 Central Connecticut State University in New Britain welcomed students from Puerto Rico initially for an intensive eight-week semester, but some students decided to stay on to complete the academic year. “I literally eat pizza every day,” said Marivelisse Acosta, 19, a freshman at CCSU. Acosta used to attend the University of Puerto Rico. Then came the hurricane in September, and for two weeks she didn’t know if her sister was alive. Instead of San Juan, Acosta now lives in New Britain, Connecticut. Acosta loves Puerto Rico so much that she got not one, but two flags for her dorm room. She remembers how the island was like a beautiful green dot in the middle of the ocean. But these days, she said people are drowning in hopelessness. She hears it in their voices, like her sister’s, when she calls home. For now, that means finishing her education. 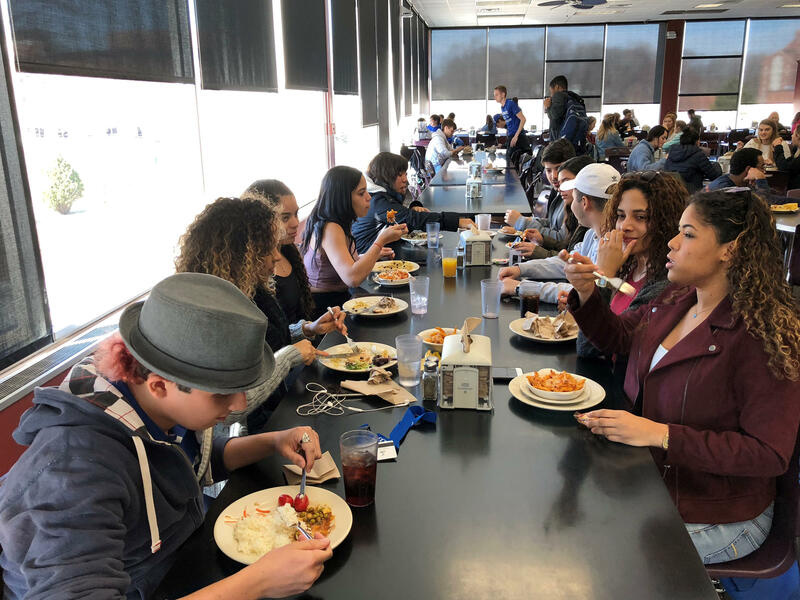 A group of Puerto Rican evacuees studying at CCSU eat lunch in the university's dining hall. 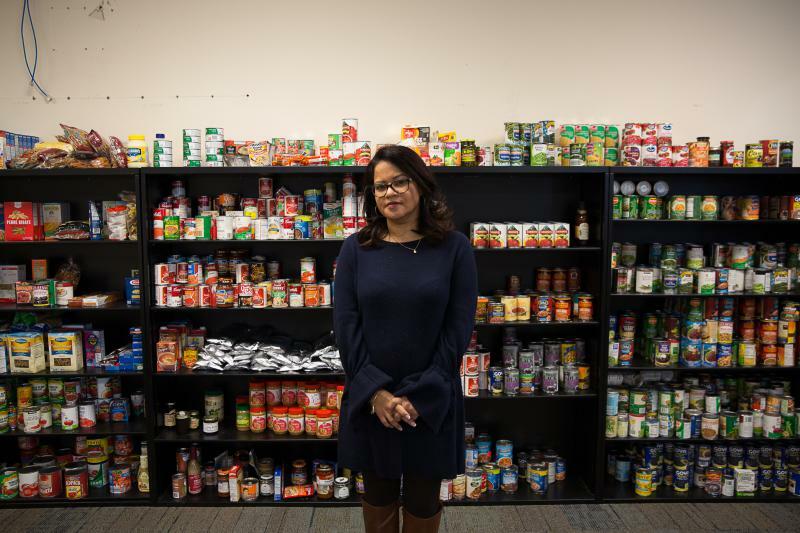 In the storm’s aftermath, this Connecticut university opened its doors to Puerto Rican evacuees who wanted to take classes in the short term. Six months after Hurricane Maria, many of those students are getting used to life in New England and now face big questions about their future: Do they stay — or return to the island they call home? Academically, the Puerto Rican students are doing well, the university said. But their stay was supposed to be temporary: Eight, intensive weeks of taking classes and earning college credits while the island recovers. 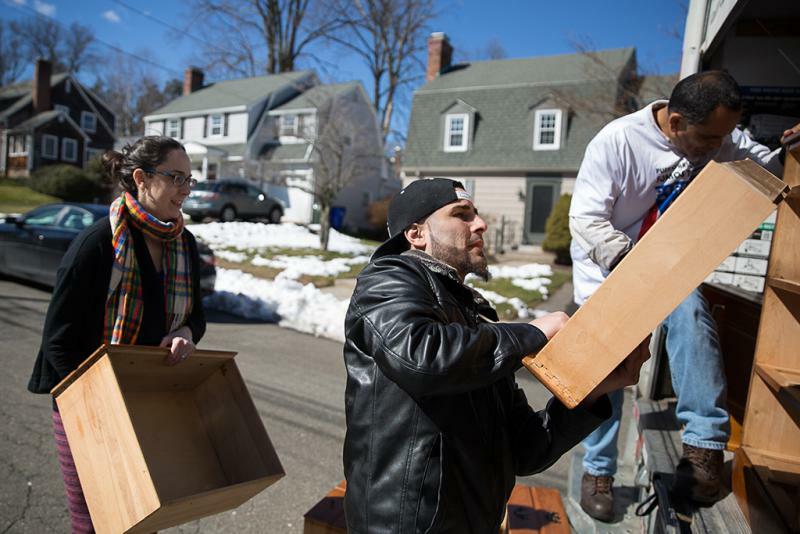 Central Connecticut State called it Airbridge, a goodwill program that had support from donors. Students had their costs covered through the winter, and now they’re taking out loans for the spring. Professor Serafin Mendez helped recruit students by placing an ad in El Nuevo Día, a Puerto Rican newspaper. 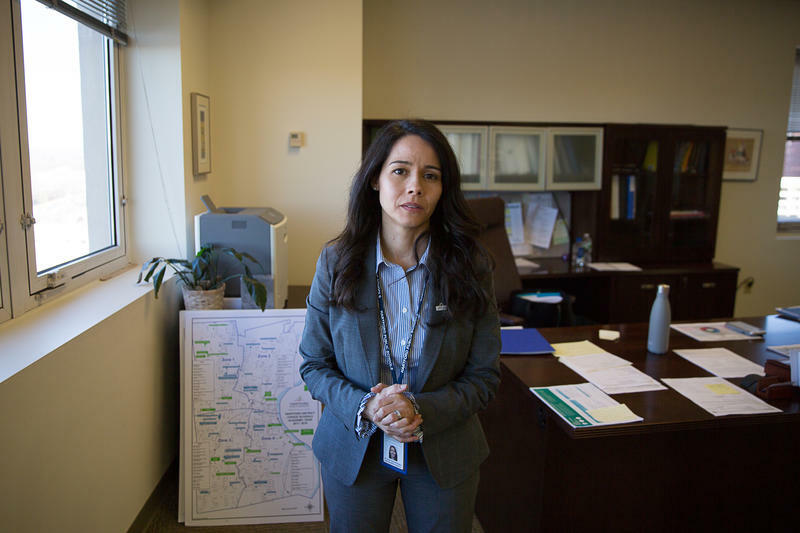 “I found it truly surprising that so many of them decided to stay here,” Mendez said. 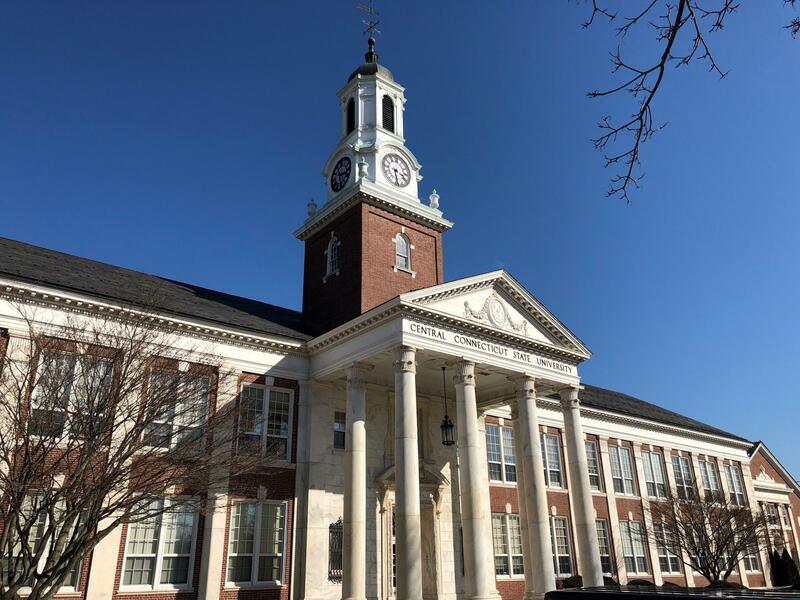 At first, 22 students came over from the University of Puerto Rico, said Lisa Bigelow, CCSU’s director of institutional advancement. Now there are 26. A few left after completing the initial eight weeks, then new students arrived for spring. One of the evacuees, Karina Lasalle, thought she’d move back home after Christmas. She’s 21 and wants to be a prosecutor someday. With all the damage in Puerto Rico, Lasalle said graduating on time seemed impossible there. So her mom is making plans to visit her in May — that’s when Lasalle will graduate with a bachelor’s degree from CCSU. After that, she wants to move home. But not Lasalle’s roommate, Joandra Vazquez. She’ll be graduating with a degree in biology and a minor in chemistry. Before the hurricane, the two were on the same track and field team at the University of Puerto Rico, running the 400 meters. While Lasalle wants to go home, Vazquez is in no rush to leave. She’s applying to pharmacy school in Connecticut. The Puerto Rican evacuees said opportunity is why eight weeks have turned into several months, or more. It also helps that they’ve become a tight group, leaning on each for emotional and cultural support. The young women live in the same dormitory, too, so there are late-night talks. “We are so close with each other,” Vazquez said. 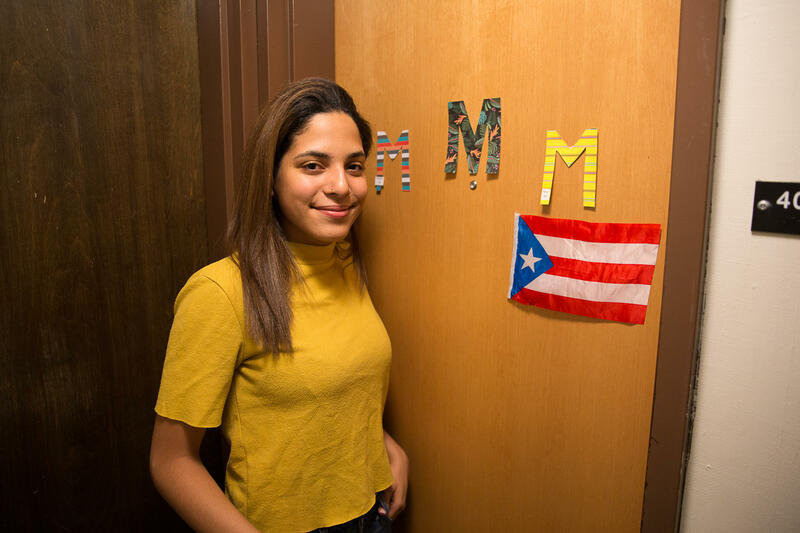 Marivelisse Acosta stands in front of her dorm room at Central Connecticut State University. She came from Puerto Rico after the hurricane in September. During a brisk walk to the dining hall, Rene Rivera considered his future. He’s here at Central Connecticut State with his younger brother, his cousin Vazquez, and Acosta, his girlfriend of a year. They all came after the hurricane. The students said CCSU has tried hard to acclimate them to college life on the East Coast. And while there’s not a whole lot they can do about the seasoning on the cafeteria rice, the university did provide them with winter clothes as temperatures plummeted. Acosta and others still talk about their shopping spree at Burlington Coat Factory, a trip financed by a generous alum. In Puerto Rico, they were used to nonstop summer. After she gets that degree, Acosta isn’t sure what she’ll do. But one thing she’s certain about is that she’s not ready to go back to the island. Carolina Riollano flew into Florida on a humanitarian plane that was packed with people. Most of them were elderly or ill. But Riollano’s reason for leaving her home was different. She came here to learn.